GameSpy online server browser was shut down in 2012. Delete or rename Gearbox_logo.bik and Ubisoft_logo.bik. Delete or rename <path-to-game>\SumacGame\Splash\PC\Splash.bmp to remove the splash screen. Widescreen resolutions are Vert- by default; see Field of view (FOV). Always enabled (option is broken). Can be forced off externally. Change ResX and ResY to the desired resolution. Change Fullscreen=True to Fullscreen=False for windowed mode. Edit the in-game key bindings to use "zoom hold" instead of "zoom". Under [Engine.InputActionDefinition] find the following line. Change the line to the following where 100 is the desired FOV. Under [SumacGame.SumacPlayerInput] add the following line. When a cutscene starts playing, press F2 to use the default FOV during cutscenes. The FOV will lower when aiming to zoom in, then zoom out to your desired standard FOV on release. This fix may or may not break sniper scopes. Start the game in windowed mode and press Ctrl+⇧ Shift+← Backspace to toggle Special K's Control Panel. 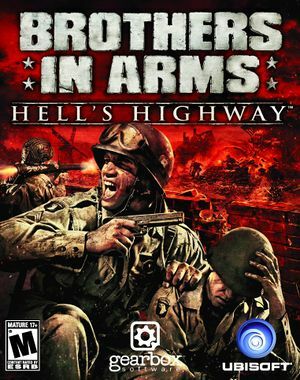 Open the Brothers In Arms: Hell's Highway profile. Set Antialiasing Compatibility to 0x000010C1. Set Antialiasing Setting to 4x Multisampling or your desired level of MSAA. Set Antialiasing Transparency Supersampling to 4x Sparse Grid Supersampling or your desired level of SGSSAA. Enable "Mute Game" under "Background Behavior". Uninstall Nvidia PhysX System Software. ↑ 1.0 1.1 File/folder structure within this directory reflects the path(s) listed for Windows and/or Steam game data (use Wine regedit to access Windows registry paths). Games with Steam Cloud support may store data in ~/.steam/steam/userdata/<user-id>/15390/ in addition to or instead of this directory. The app ID (15390) may differ in some cases. Treat backslashes as forward slashes. See the glossary page for details.